The FCMC team and hospital board will be hosting a groundbreaking ceremony on Wednesday, April 25th at 3 pm in front of the main hospital. 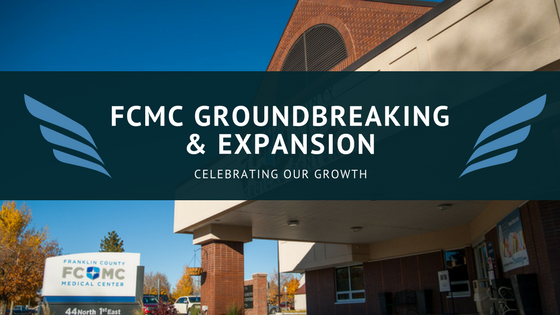 The public is invited to help celebrate our expansion of the hospital, enjoy light refreshments, and speak to the hospital leadership about the plans for development as well as the future growth of the FCMC campus. Recognized as a Top 100 Critical Access Hospital in 2017 and 2018, FCMC continues to find ways to improve health care access in Franklin County. The new expansion focuses on safety, privacy and maximizing space for operating rooms (OR) and emergency rooms (ER), as well as their supporting services. The design of the Outpatient Surgery Center also encompasses a lean flow with pre and postoperative care rooms able to flex for ER situations in the case of multiple trauma incidents and gives a more direct connection to vital services such as CT scans and radiology. Other essential elements include a PACU (post-anesthesia care unit) for recovery, an isolation room for decontamination of hazardous materials, a behavioral health room for privacy and safety of patients with emotional and behavioral needs, and an expansion of the pharmacy, lab and radiology areas. All of this is phase one in a multilevel and multiyear plan that includes the growth of the FCMC Specialty Clinic and Rehabilitation Services. The goal? To continue delivering Hospitality and Excellence in the community. As with any large-scale effort, getting here hasn’t been an overnight process. The hospital board, administration, and county commissioners worked together for several years, considering various paths for both location and funding. As many in the community know, a voter bond initiative was previously voted on after a large plot of land was donated. The bond was solidly defeated, sending a clear message that the hospital needed to find alternative funding. Through a competitive two year process, which included several layers of reviews, we acquired financing of $8.8 MM backed by the USDA, with absolutely no liability to Franklin County. What were some of those steps in the process? Efficiency flow reviews to help determine the best location for expanding. Water quality reviews and environmental impact studies including looking at endangered species. Securing a $1 MM loan from lender Lewiston State Bank. Working with the Idaho State Historic Preservation Office to review plans of the final construction area and determine if any items were of historical value. A cultural resource specialist from SWCA Environmental Consultants was also brought in to inspect the area twice to review any historical importance of homes, trees, and surrounding property. In this process, the entire FCMC team realizes that while experts may not have found any historical impact, we fully understand the emotional impact for many in the community. We are thankful to the previous residents of the homes for seeing the importance in allowing us to expand. We are grateful to the USDA and the tireless efforts of our team in securing funding that doesn’t include any taxes on our city or its residents. Across the country, rural medical centers and hospitals are closing, having a devastating impact on the communities they served. We will not allow this to happen to FCMC. The health of the community also means the health of our economy. We will continue working to grow providers, services, facilities, and most importantly strong community ties. There is no impact on the current quality of services during the construction. The ER entrance is now at the south end of the hospital facing west. For after-hours access, we have installed an emergency access button to call the nurses station for entry. Our CEO and other hospital administrative leaders will continue to reach out and answer all questions about the expansion through frequent visits to the community, as well as updates through the website and facebook. For additional questions or if you would like to host a hospital outreach event at your business or home, please contact the hospital front desk at 208-852-0137 or email marketing-dg@fcmc.org.